Want some quick, cheap, decent Mediterranean food on the late night? Head to Gaby's Mediterranean, usually open til about 1 am. The small, cute, cafe-style restaurant is very vegetarian friendly, with even an entire section on the menu for vegetarian mezza, or appetizers. Dine in, and get complimentary zaatar...imagine the Mediterranean version of the classic olive oil-balsamic vinegar combination for bread dipping. Instead, you've got olive oil mixed with herbs and spices, and served with pita bread. Very good. There is ample seating in sort of an outdoor, tent-covered dining room, so bring a jacket for winter nights, or come late in the summer for a nice evening meal. I even hear this is a BYOB restaurant, so I'll have to explore that option for dining in. Hookah pipes are available, so beware: that means cigarette smokers are also possible. And come cash-prepared: there's a $10 credit card minimum. Four to five nice-sized falafels are wrapped in a thin, lavash-like wrap with chopped tomatoes and a yogurt sauce. A little more could be included in the sandwich: more chopped tomatoes, more sauce, maybe some shredded lettuce. The tomatoes were rather unripe and bland, so that didn't help much with the flavor. The yogurt sauce added some saltiness, and there may have been a hint of mint mixed into it. The falafels (the most important part of the sandwich) were okay; I've had better. The deep-fried coating was nice and thick and crisp, but the inside was slightly dry and, again, bland. I tasted lots of parsley and cumin, but not much else. All sandwiches are served with your choice of rice, a house salad, or fries. Fries were good, your standard medium-sized cut, crispy in all the right places, and seasoned with salt and I'm guessing paprika and a little cayenne. All in all, I'm not quite sure if I'd get the falafel wrap again. Eat here again? 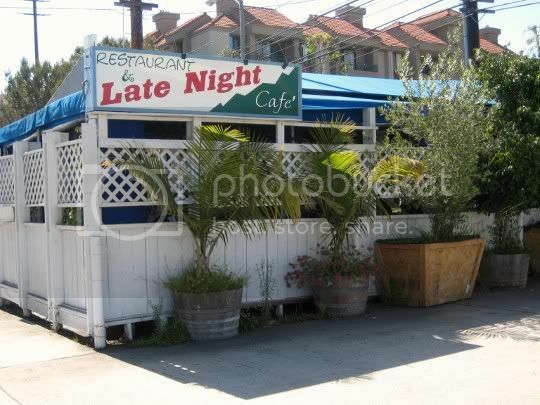 Yes, it's a nice, different option for late-night eating. Oh yes. Venice and Mentone. I've passed by hundreds of times but I'll have to check them out. Thanks for the tip. There is one being built on La Cienaga and Washington Blvd in Culver City for future reference. I saw! I can't believe they shut down the Pizza Hut LOL. 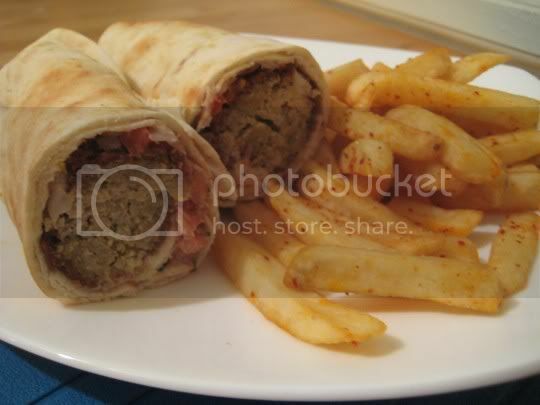 I have had better falafel but it is decent, priced well, comes with decent sized salad or fries, and they are open late. Sorry to hear it was kind of bland!